Here is an adorable outfit to keep your preemie babies warm and cozy as they enter into this world. Plus, it looks like a lovely design for both baby boys and baby girls. 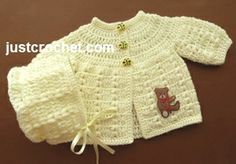 You will need a sport weight yarn, a 3.50mm crochet hook, 3 buttons and a ribbon.